Savvy sonar operation helps to pinpoint "the other white meat"
Bucktooth bandits with a frustrating habit of stealing ill-presented baits. That’s one way to describe sheepshead ; but you might also call them sporty, abundant and oh, so tasty. Indeed, the striped member of the porgie clan with pearly white meat often compared to lobster, is highly regarded as a prized inshore catch throughout southeastern waters. Their capture requires a few strategic details, but one of your most valuable tools is something not commonly considered for inshore species — electronics. 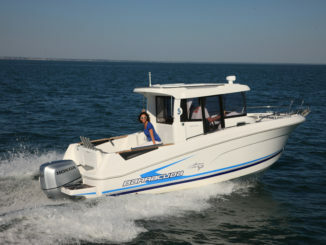 Your Raymarine Multifunction Display (MFD) unit can tell you a lot about what lies beneath the surface. 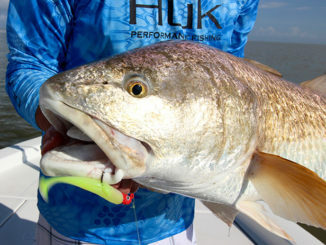 Spoiler alert: We’re not talking about those shallow flats where redfish tail and speckled trout hug the potholes. Rather, we’re gonna look at something far less obvious, so read on. Docks and other structures where crustaceans abound make excellent sheepshead habitat. To set the stage, sheepshead like structure, because that’s where their forage preferences live. Those protruding incisors are made for cracking shells, so crabs, barnacles, shrimp, mollusks are all fair game. Docks, seawalls, piers, bridges and jetties offer dependable sheepshead opportunities — especially during their winter-spring spawning aggregations. Elsewhere, coastal marshes often find sheepshead roaming spartina grass edges or poking around Louisiana Roseau cane. Oyster bottom and noticeable shell bars are the sweet spots, as the crustacean count increases; but if you’ve ever idled a low-tide marsh, you’ve probably seen fiddler crabs waving those oversized claws on every sandy point you pass. Residential docks offer yet another highly-productive sheepshead scenario, especially the ones with multiple slips, extended walkways and lots of pilings. The more habitat, the better and if you come across a dock crumbled by time and tide, or perhaps, tropical storm damage — jackpot. The debris that falls into the water below catches all sorts of trash and flotsam to form a briny log jam of sheepshead potential. 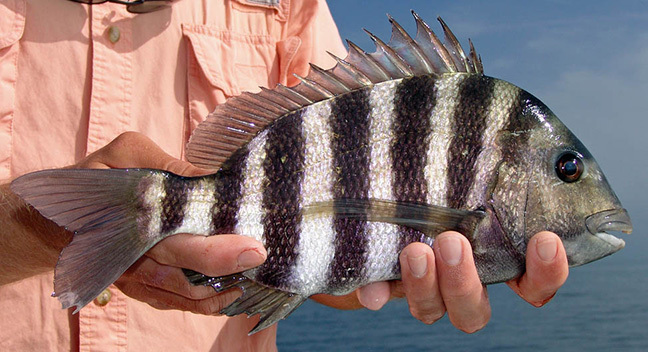 While all of these will certainly offer you abundant sheepshead opportunities, the visible spots get a lot of fishing pressure because anyone can find them and fish them. Nothing wrong with standing atop a land-based structure — maybe with a little Aqua Vu camera recon; but savvy anglers in search of the bigger sheepshead will target the shallow reefs and wrecks scattered throughout bays and estuaries. Here, in these less-trafficked areas, sheepshead enjoy plenty of cover, food and seclusion — usually with less congestion than the inshore stuff. Raymarine Axiom’s RealVision 3D comes in handy here, as the ability to scan a structure site reveals all the relevant features sheepshead like. You’ll want to look for undercut areas where they can tuck in tightly when the current runs swiftly, as well as the high spots where the biggest and most aggressive fish often hold during peak feeding periods. And, of course, locating groups of fish and noting the bigger marks helps dial in your presentations. You’ll also do well to look for those sneaky little rock piles along channel edges. Run the ditch and monitoring SideVision will reveal isolated structures that could be bristling with ‘heads. 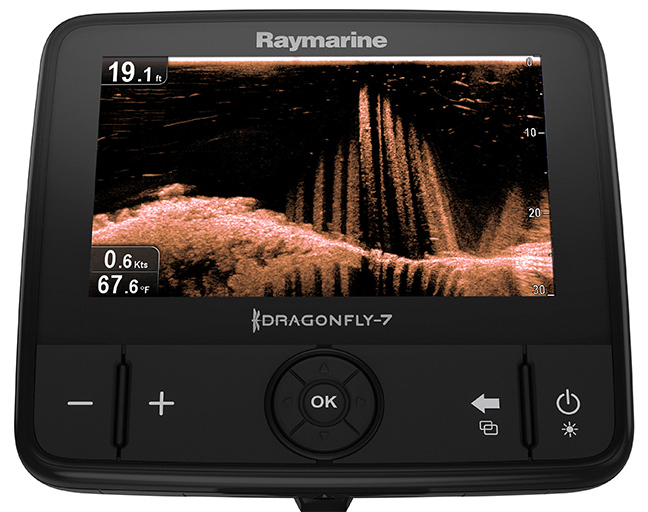 The 60° wide beam of CHIRP DownVision sonar is perfect for finding fish close to structure. 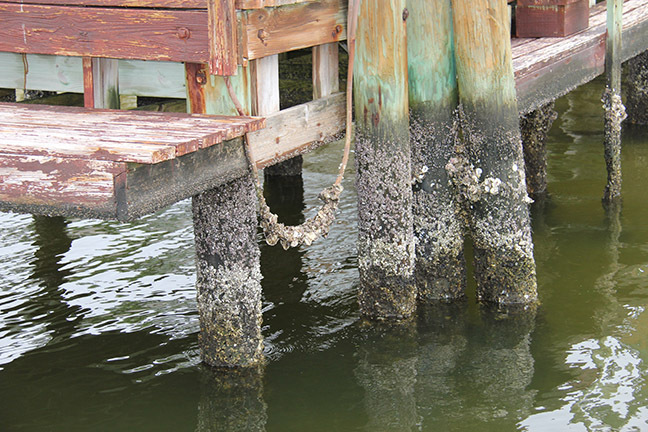 These dock pilings, imaged with Raymarine’s Dragonfly system, are the perfect habitat for Sheepshead. Optimal Conditions — Because sheepshead are mostly sight feeders, sunlight helps them spot your baits. Current always stimulates feeding, but the peak of a hard tide makes it tough to keep your baits on point and out of the snaggy stuff. 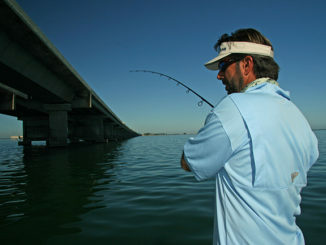 Even if you do hit the mark, sheepshead won’t fight a heavy current, so feeding usually tapers until the water slows. Rigs — Whether you’re fishing shrimp, fiddler crabs or shucked oysters, ditch the old fish finder rig, as it’s far too snag-prone for the sheepshead habitat. Also, because the sheepshead bite is nanosecond quick, reaction time is key. A heavy split shot rig is one option, but you’ll find a 1/8- to 1/4-ounce jig head, like the Z-Man Trout Eye, a better option, as it keeps bait and weight efficiently packaged. Easier in and out for the tight spots, plus direct strike response. Another option — the dropshot. Take a page from the bass angler’s playbook and rig a hook perpendicular to your main line with a drop leader and weight below. Match your leader length to the depth that your fish are showing on your Raymarine unit’s high-definition screen and use just enough weight to hold your rig in place. Prominent front teeth and sharp dorsal spines are notable sheepshead traits. Tackle Tips — You’ll do more vertical dropping than long casting for sheepshead, so a 7-foot rod, such as St. Croix’s Tidemaster Inshore heavy-power, moderate action spinning rod is ideal. You’ll want plenty of backbone for quickly separating fish from fortress, but a moderate tip allows just enough “give” for the fish to get the bait and hook. The second you feel steady pressure, you’ll want to come tight like yesterday, so your Seaguar Smackdown braid is a must here. 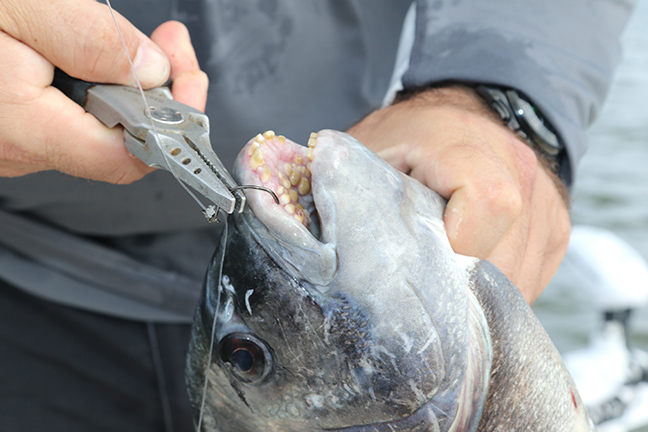 Watch the Points — A sheepshead’s crushing style teeth pose little biting hazard, unless your finger ends up inside the mouth (but, that’s what needle nose pliers are for. Just sayin’.) The real threat are those knitting needle spines on the dorsal fins. Get too close and you’ll receive a memorable poke in the palm. Safest grip is below the chin, ahead of the ventral fins. Hold the leader to suspend the fish vertically, grip the fish firmly with its chin resting in your palm and safely remove the hook. If your sheepshead is short, send him on his way; if not, take him home for one of the best seafood dinners you’ll ever enjoy. 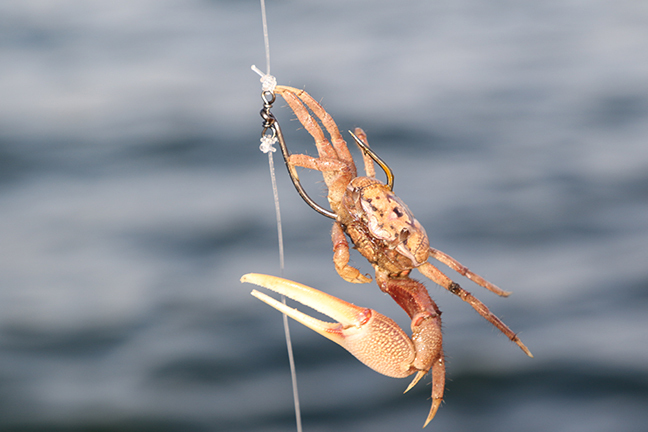 Fiddler crabs are tough to beat for sheepshead baits.